Hivpoint’s helpline is closed today, Tuesday November 14th. Our phone line is open again tomorrow between 10 a.m. and 3:30 p.m. Through our phone line you can discuss everything related to sexuality, sexual health and HIV. All conversations are anonymous and confidential. 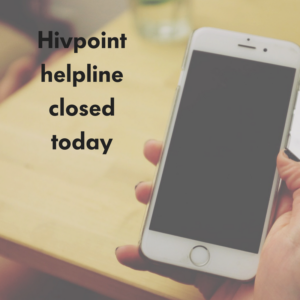 Hivpoint helpline: Every week Mon-Thu 10 a.m.-3:30 p.m. Remember also our chat service – every Monday between 10 a.m. and 3:30 p.m.!